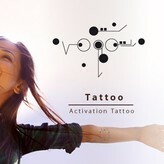 Raise the frequency of your body with this encoded body tattoo! The unique geometrical design brings a feeling of frequency in the cell memory, which enables an active approach and mind-set. 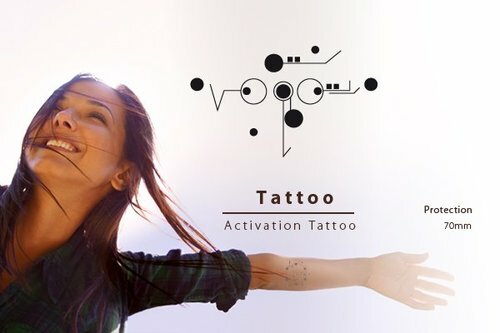 The tattoo lasts for a couple of weeks and during this period the energy channels are opened in your body, so that polluted or any 'cropped up' emotions can be set free. Apart from the design being a beautiful eye-catcher, which people will certainly ask you about, you will also inspire others. The Body Activation Tattoo is not permanent, but designed in such a way, that you will directly activate a harmonious frequency in yourself. The cells in your body will adapt themselves to this frequency (and according to your own body’s intelligence) will be absorbed into all your muscles, cells and organs. You can feel this, after only a few days. Known effects are: better concentration, sharpened senses, more inspiration and more understanding about what you are doing. It makes you stronger in your interaction with others and the daily challenges that may face you. The frequency of Protection helps you to shield yourself from energies that are lower than your own frequency, so that it is easier for you to stay engaged in the flow. The tattoo will last (if applied properly) for approximately a week in good quality (this includes showering, swimming etc). If you wear clothes over the tattoo, there may be some discoloration. Our ‘false’ tattoos have been extensively tested and do not contain PPD or black Henna.